As the holiday season approaches many family traditions come to mind. This is always one of my favorites. It can be made in a food processor or blender using all raw ingredients. 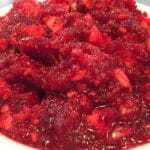 This delicious Cranberry Sauce for Thanksgiving can be prepared in advance for your family celebration. I took liberty to enhance my mothers with our wonderful Cultivated Tree Cranberry Pear White Balsamic. Put it together at least a week in advance and check that side off the list. It is easy to make and really tastes delicious. If you happen to have any left over after the big day, use it on turkey sandwiches with a bit of brie, lettuce and mayo on a crusty bread. 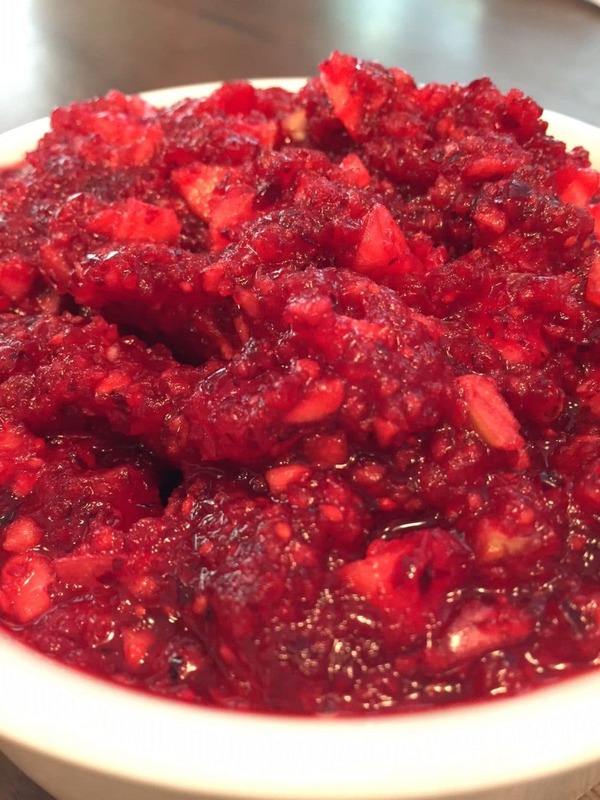 This 'make ahead' fresh cranberry sauce has morphed from my mother Margaret's recipe. Over the years it went from this very very tart sauce to a rather spiked version ... but with seven kids you can hardly blame her. In the years since opening our store - well, I've added my own touch. But this one will always make me smile and think of mom - still with us at age 96! I always have to make extra - it only gets better with age. Make it at least a week in advance. Working in batches using a food processor, chop the cranberries to a medium fine consistency and place in a large mixing bowl. Zest the entire naval orange with a micro-planner and add to the cranberries. Peel the white pith from the orange and cut into cubes and add to the bowl. Cut, core and coarsely chop the apples in the processor and add to the mix. Stir in the sugar, Brandy or Makers Mark, the Cranberry Pear White Balsamic and the grated nutmeg. Blend everything well; it will be mouth puckering tart at this stage ... store in a glass jar or bowl until the day of use. If you are tempted to taste it as the flavors develop ... add sugar a few tablespoons at a time. The day of use - adjust the sugar to taste; pour into a serving dish - add the coarsely chopped pecans and enjoy!